You came by the tens of millions to become part of a historic movement the likes of which the world has never seen before. At the center of this movement is a crucial conviction: that a nation exists to serve its citizens. Americans want great schools for their children, safe neighborhoods for their families, and good jobs for themselves. These are the just and reasonable demands of a righteous public. This American carnage stops right here and stops right now. We are one nation – and their pain is our pain. Their dreams are our dreams; and their success will be our success. We share one heart, one home, and one glorious destiny. The oath of office I take today is an oath of allegiance to all Americans. Subsidized the armies of other countries while allowing for the very sad depletion of our military; We've defended other nation’s borders while refusing to defend our own; And spent trillions of dollars overseas while America's infrastructure has fallen into disrepair and decay. We assembled here today are issuing a new decree to be heard in every city, in every foreign capital, and in every hall of power. From this day forward, a new vision will govern our land. From this moment on, it’s going to be America First. We will build new roads, and highways, and bridges, and airports, and tunnels, and railways all across our wonderful nation. We will get our people off of welfare and back to work – rebuilding our country with American hands and American labor. At the bedrock of our politics will be a total allegiance to the United States of America, and through our loyalty to our country, we will rediscover our loyalty to each other. When you open your heart to patriotism, there is no room for prejudice. The Bible tells us, “how good and pleasant it is when God’s people live together in unity.” We must speak our minds openly, debate our disagreements honestly, but always pursue solidarity. When America is united, America is totally unstoppable. There should be no fear – we are protected, and we will always be protected. We will be protected by the great men and women of our military and law enforcement and, most importantly, we are protected by God. Finally, we must think big and dream even bigger. In America, we understand that a nation is only living as long as it is striving. We will no longer accept politicians who are all talk and no action – constantly complaining but never doing anything about it. The time for empty talk is over. Now arrives the hour of action. Do not let anyone tell you it cannot be done. No challenge can match the heart and fight and spirit of America. We will not fail. Our country will thrive and prosper again. We stand at the birth of a new millennium, ready to unlock the mysteries of space, to free the Earth from the miseries of disease, and to harness the energies, industries and technologies of tomorrow. It is time to remember that old wisdom our soldiers will never forget: that whether we are black or brown or white, we all bleed the same red blood of patriots, we all enjoy the same glorious freedoms, and we all salute the same great American Flag. And whether a child is born in the urban sprawl of Detroit or the windswept plains of Nebraska, they look up at the same night sky, they fill their heart with the same dreams, and they are infused with the breath of life by the same almighty Creator. 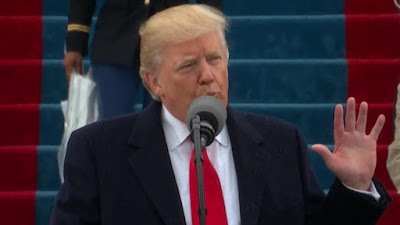 So to all Americans, in every city near and far, small and large, from mountain to mountain, and from ocean to ocean, hear these words: You will never be ignored again. Your voice, your hopes, and your dreams, will define our American destiny. And your courage and goodness and love will forever guide us along the way. Together, We Will Make America Strong Again. I thought that it was interesting that Trump doubled down on the nationalism which has been the locus (at least in his mind) for the energy which animated his campaign and won him the Presidency. Trump is setting a frame that will be difficult though not impossible for Democrats to break. This will be divisive but there's a reason that nationalism is on the rise across the developed world while trans national organizations and concerns are losing popularity and legitimacy. We're living in really interesting times. What's your take on this speech? Meaningless red meat for the rubes or serious indication of planned actions? Did you read/hear anything that really excited you or really angered you?